Caroline Constas "Lou" shirt with floral-print. Approx. length: 24.3"L down center back, 27"L from shoulder to hem. Smocked, off-the-shoulder neckline. Caroline Constas "Lou" shirt with floral-print. Approx. length: 24.3"L down center back, 27"L from shoulder to hem. Smocked, off-the-shoulder neckline. Long sleeves; tie cuffs. Relaxed silhouette. Slipover style. High-low hem. Cotton/nylon/spandex. Made in USA. Model's measurements: Height 5'10"/177cm, bust 33"/84cm, waist 25.6"/65.2cm, hips 35.8"/91cm, dress size US 2-4/FR 34-36. 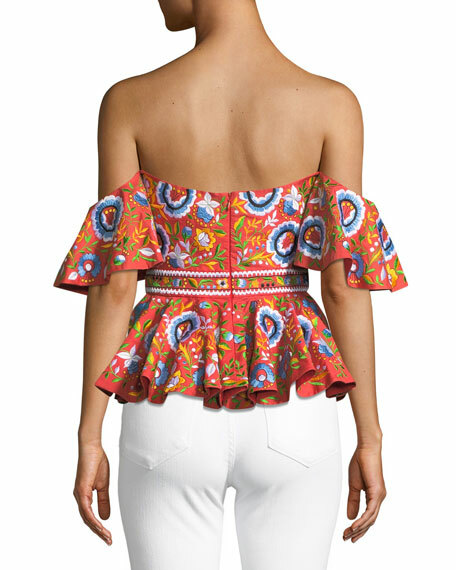 EXCLUSIVELY AT NEIMAN MARCUS Fuzzi colorful cactus-print top with ruffle trim. Off-the-shoulder neckline; fringe tassel ties. Long sleeves. Relaxed fit. 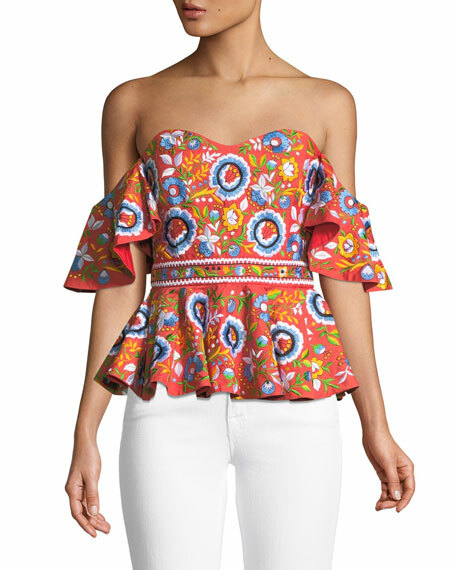 EXCLUSIVELY AT NEIMAN MARCUS Fuzzi colorful cactus-print top with ruffle trim. Off-the-shoulder neckline; fringe tassel ties. Long sleeves. Relaxed fit. Straight hem. Pullover style. Nylon. Dry clean. Made in Italy. Johanna Ortiz "Bahanias" ruched top with Maldives-stripe detail. One-shoulder neckline with knot detail. Cap sleeve on right. Fitted. Back zip. Johanna Ortiz "Bahanias" ruched top with Maldives-stripe detail. One-shoulder neckline with knot detail. Cap sleeve on right. Fitted. Back zip. Cropped length. Cotton. Lining, polyester Dry clean. Imported. Model's measurements: Height 5'10.5"/179cm, bust 32"/82cm, waist 23.5"/60cm, hips 34.5"/88cm, dress size US 2. Jonathan Simkhai knit lace bustier top. Square neckline; hook-and-eye front closure. Short puff sleeves. Fitted silhouette. Cropped hem. Cotton/nylon/spandex. Polyester lining. Dry clean. Imported.